We are entrepreneurs, artists, volunteers, students, public servants, and professionals in many fields. 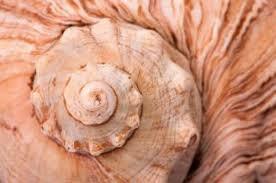 In all stages of life, you will find members to inspire and support your endeavours: Monthly Meetings, Activity & Interest Groups, After 5 Network, Neighbourhood Groups. We value education and lifelong learning and create opportunities for continuing education in the company of stimulating women – within the club and internationally via webinars and conferences. Every year we provide 26 scholarships and bursaries totaling over $35,000 to women attending the University of Victoria, Royal Roads University, and Camosun College. We are an organization that collaboratively develops policy to speak with a common voice in support of rights and opportunities, especially access to education for women and children. Have a look at our Resolutions. Interact with women who are open and interested in friendship and shared activities through Activity & Interest Groups and Neighbourhood groups. See more events on our calendar and list of monthly meetings. Learn more about becoming a member or contact us about attending a meeting. Founded in 1908 as a voluntary, non-partisan, non-profit association, our current membership includes more than 250 outstanding women. Our past members include Emily Carr - Artist, Dr. Helen E. Reynolds (Ryan) - the first woman to be accepted to the Canadian Medical Association, Mrs. Jay Durand - Founder of the Victoria Conservatory of Music, and Senator Nancy Hodges – first female Speaker of the Legislature. In 1919 the Canadian Federation of University Women was formed as a response to the formation of the International Federation of University Women, now Graduate Women International. This had been founded by three women - an American Dean and two British professors - in the aftermath of the First World War, in the hope that a worldwide association of university women would help prevent another such catastrophe. Today, CFUW is a voluntary, non-profit, self-funded non-governmental organization of close to 10,000 women graduates and students in 118 Clubs in every province of Canada. CFUW/FCFDU members are active in public affairs, work together for equality for women and girls to raise the social, economic, political and legal status of women, as well as, to improve education, the environment, peace, justice and human rights. CFUW/GWI is the largest of the 79 member affiliates of the International Federation of University Women (120 countries). GWI has special consultative status at the United Nations. CFUW belongs to the Sectoral Committee on Education of the Canadian Sub-Commission for UNESCO. CFUW/GWI, its Clubs, and its members support the CFUW/GWI Charitable Trust which awards fellowships for post-graduate education. CFUW BC Council membership consists of the 23 CFUW Clubs located within the Province of British Columbia. There are 3 Regional Districts - BC East with 5 clubs, Vancouver Island with 7 clubs and BC West with 11 clubs. 3. To render financial aid to deserving undergraduates or students engaged in postgraduate work at any recognized university. Over 40 activity groups that usually meet monthly – reading, writing, walking, cultural affairs, investment groups, etc. Special Projects such as the 75th anniversary – raised $5000 to go to UVic for doors of Interfaith Chapel. Resolutions process – national through CFUW annually – propose, discuss, vote, and if passed - policy and follow up at appropriate level. 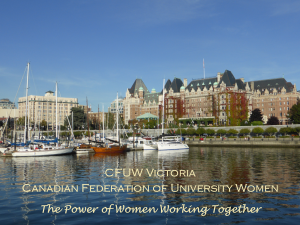 In recent years CFUW Victoria has put forward three resolutions that have passed nationally and one (2007) – Creation of a Women’s UN Agency went to GWI (2007) and to the UN that has voted to act on it. You will feel proud to belong to an organization that collaboratively develops policy to speak with a common voice in support of rights and opportunities, especially access to education for women and children. You will find others to inspire your personal involvement. Have a look at our Resolutions. We are entrepreneurs, artists, volunteers, students, public servants, and professionals in many fields. In all stages of life, you will find members to inspire and support your endeavours: Monthly Meetings, Activity & Interest Groups, After 5 Network, Neighbourhood Groups. We also have a monthly newsletter. We value education and lifelong learning and create opportunites for continuing education. Every year we provide 31 scholarships and bursaries totaling over $40,000 to women attending the University of Victoria, Royal Roads University, and Camosun College. We at CFUW Victoria believe in lifelong learning. Education is the most powerful tool in bringing about positive change and educated women especially are essential in building a better future. There are many educational opportunities within the club, as well as provincial and national conferences and learning via webinars through GWI (Graduate Women International). Monthly meetings with informative speakers. Over 40 Activity & Interest Groups that meet weekly or monthly - reading, travel, investing to name a few. Establishment of ad hoc committees to research a particular issue or write a brief (many presented during Club’s history – 14 in 25 year period 1958-1984). Within the group, we strive to provide other learning opportunities such as our Social Media workshops, where participants had hands-on learning about Facebook, Twitter, and other aspects of mobile devices.